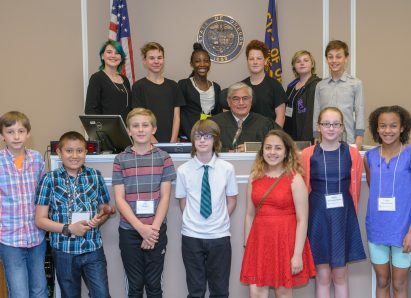 Thirteen students from Ms. Valerie Turner’s social studies class at Beaumont Middle School spent last week learning how the American court system works. These students took part in Law Camp, a partnership between Classroom Law Project and Lewis & Clark Law School. The immersive experience gives them practical experience in what it’s like to be part of a trial as lawyers, defendants, plaintiffs, and witnesses. Using this year’s mock trial case, Landry Lopez v. Buddie’s Burgers LLC, the class engaged in a fun, practical learning experience. Besides the time spent with CLP staff, volunteers, and counselors from the Law School, the students also had a chance to engage with legal professionals. CLP Board member Steffan Alexander hosted the class for lunch one day, offering his insights on the case and his experience as an attorney. Then, on Friday, they got their chance to practice what they learned. Multnomah Circuit Court Judge Angel Lopez opened his courtroom to the students who tried the case in front of him. Judge Lopez offered each student feedback and congratulated them on their knowledge and skill. Clearly these talented kids have a lot to offer as they learn to be active citizens!